It usually happens that you’re not able to wash your face properly and you start getting pimples, black-heads etc. Neutrogena brought to you its solution now! You may apply different creams or go to salons and what not to just get rid of those ugly marks on your skin? Soap and splashing off with water really quick is what we normally do every morning, but did any of us realize how bad the skin would get if it’s not washed properly? So, today I’m speaking about the newly Neutrogena Deep Clean Gel Wash, it’s amazing! I’ve tried it over 3 days now ever since I’ve got this, and the results were absolutely amazing! It’s a dermatologist tested product, and it cleanses deep down into pores, dissolves away all the traces of dirt, makeup or oil. It leaves your skin soft, smooth and clean. 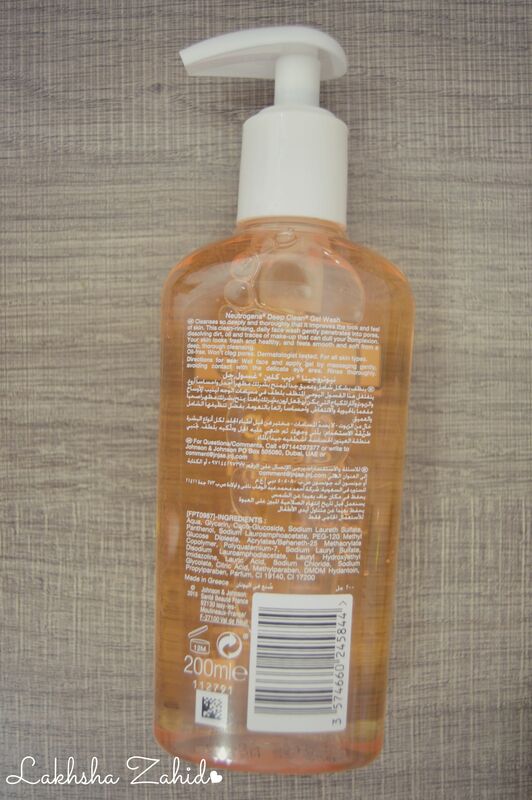 This 200 ml bottle will exactly last how often you use it, but not to forget, the more you use it, the earlier your skin becomes better and better. It’s for all types of skin, so you don’t have to worry if your skin is dry or oily. How should you be using this? Just wet your face a little with wet hands, put up a little of it on your hands and massage it on your face for at least 30 seconds or a minute, and just rinse it! As per my opinion since I have a normal skin, it left my skin really soft after I used it the first time, and now after I’ve used it a couple of times, the difference really is noticeable, my skin has become more radiant!! This product is available at Pharmacies and Modern Trade Outlets all across the U.A.E. Love to give this a try but my skin is very sensitive. I’m scared to have an allergic reaction. I’m sure it wouldn’t harm you as my skin is very sensitive too! Would love to give this a try but my skin is very sensitive and i’m scared to have an allergic reaction.